"Oh, of course their tryin' to screw ya. No one know what they're talkin' about! It's like, "Oh, seems you need a new johnson rod." Oh! Yeah! Johnson rod! Well, get me one of those! George Costanza, that wise paragon of all things debauched and pinch-weaselly, said it best when he claimed that mechanics can get away with whatever they want. Actually I'm being unfair. I trust my mechanic....I'm just resentful that The Pebble needs a new oxygen sensor. Or so they say. My goal is for my car to live to be 20 years old...less than three years left! I have subscribed to a new podcast called Existentialism In Literature And Film, offered through UC Berkeley. I find it very interesting and nostalgic, especially since it will discuss films as well. I have not studied philosophy since university. I will never forget reading Sartre and Camus as well as studying various philosophers' approaches to art and beauty. Second year university at McMaster was one of the loveliest of times for mind-expanding discussions with wonderful friends over meals at the campus pub. Nonetheless I do have a bit of a love/hate relationship with philosophy. On the one hand as individuals in this crazy world we strive to understand ourselves, consciousness and what the heck everything means. Philosophy has lots of nice little compartments and categories for this theory or that concept, but at the same time I sometimes think that it is really just pretentious drivel...that it's all irrelevant and for us to just stop debating and get outside and experience what we're talking about already. However, hearing in this podcast how everyone from Plato to Nietzsche formed their opinions of humanity and metaphysics is just plain cool. 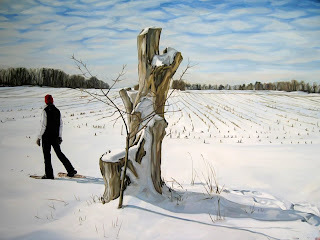 Above is my newest painting, "Gayle, Snowshoeing". It has taken forever but I am pleased with the result. Tackling larger paintings is still rather intimidating....there's something comforting in approaching a small canvas...but with a larger surface to cover my brushstrokes become stiff and tame compared to the looser, more confident brushstrokes of smaller pieces. I am trying consciously to change this behavior and try to just relax with the larger pieces. Currently I am watching Judgement At Nuremberg. Montgomery Clift is brilliant here, but all of the cast are really. It is a powerful courtroom drama dealing with such horrors that apparently the cast had a very difficult time with it...which is more than understandable. Pet Peeve of the day: Putting ice cream on warm pie. It mixes together and melts into a messy mixture of pie filling, and ice cream and soggy crust... I can't handle it! Song I am listening to: Njosnavelin by Sigur Ros. It's fantastic. "Well, I guess I'll have to pick myself up, dust myself up, and throw myself right back down again!" I do love the album as well. I'm not sure if I have that single..I'll check for it, thanks!